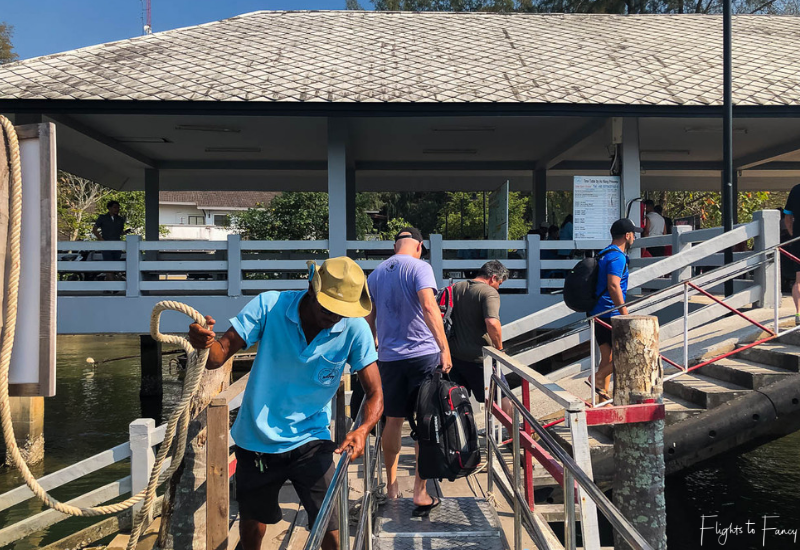 Even though I found Klook had the lowest price on the ferry from Phuket to Krabi, I still looked around for the best deal when it was time to book my Koh Lanta to Krabi ferry. Part of my philosophy of travelling in luxury for less means getting the very best price I can on every element of my travel. Saving pennies where you can allows you to splurge on something amazing later. 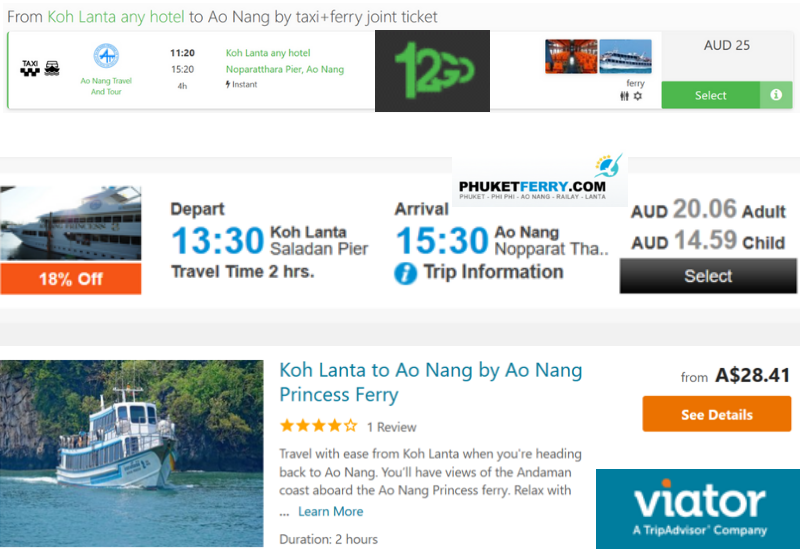 I concentrated my search on six websites; Phuket Ferries, Direct Ferries, Klook, 12GO, Viator and Get Your Guide. Direct Ferries and Get Your Guide were ruled out straight away. 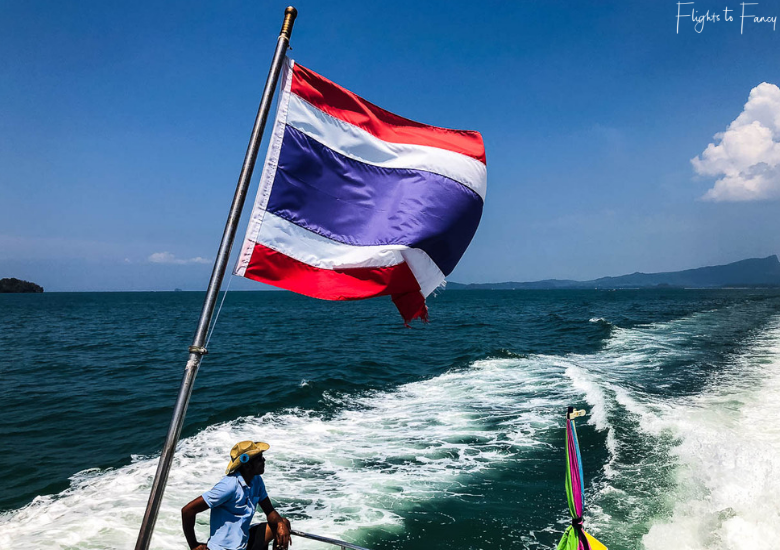 Direct Ferries had no options from Koh Lanta to Krabi and Get Your Guide strangely only offered the reverse journey from Krabi to Koh Lanta. 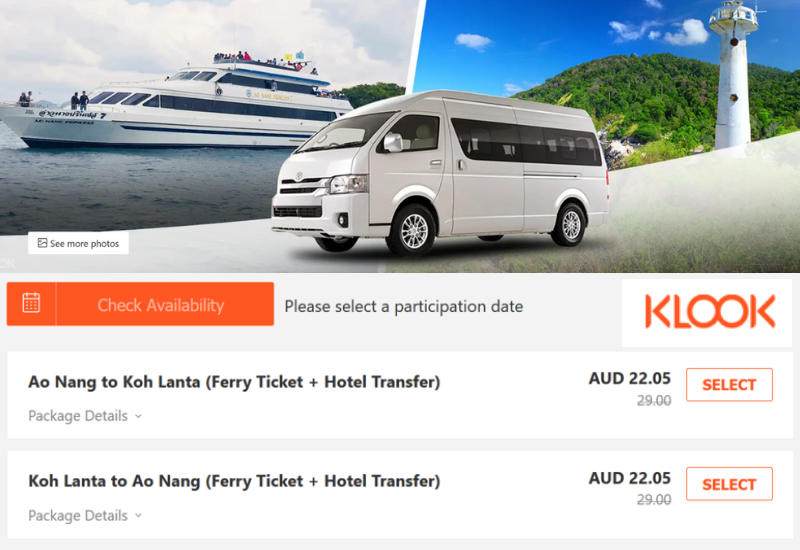 The remaining four all offered tickets on the Koh Lanta to Krabi ferry at various price points. Viator was ~AUD$28, 12GO was ~AUD$25, Klook was ~AUD$22 and Phuket Ferries was the cheapest at ~AUD$20. We booked with Klook because they offered hotel pick up and drop off in the Krabi ferry price which saved us much more than $2 a piece. We stayed at the Lanta Sand Resort in Pra-Ae Beach (Long Beach) for the three days we spent in Koh Lanta. The Klook voucher we were issued for our ferry from Koh Lanta to Krabi stated we would be collected at 12.30pm. When our driver arrived the tuk tuk looked full, but he managed to squeeze The Hubs and I into the cabin and threw our High Sierra rolling duffels on the roof. We felt blessed to have the benefit of air conditioning while the other passengers sat in the open air cabin in the back. We made one more pick up along the way. She squeezed into the back making us 10 passengers in total. The distance to Saladan Pier Koh Lanta was short and we arrived at about 12.45pm. 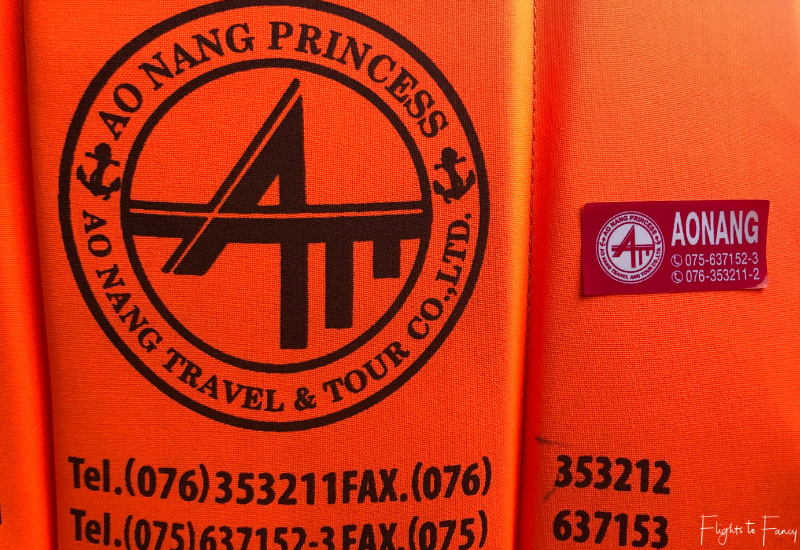 We had no trouble finding the Ao Nang Travel & Tour Co desk to check in for the Koh Lanta to Krabi ferry. We were given a red ‘Ao Nang’ sticker and were good to go with half an hour to spare. We had an early lunch at Thai Cat before we were picked up, but there is a café/restaurant at Saladan Pier if you need a quick meal. The Hubs used the toilet without eating and paid ฿5 for the privilege. I contemplated it myself until he told me it was a pit toilet and I decided I could hold on a bit longer. 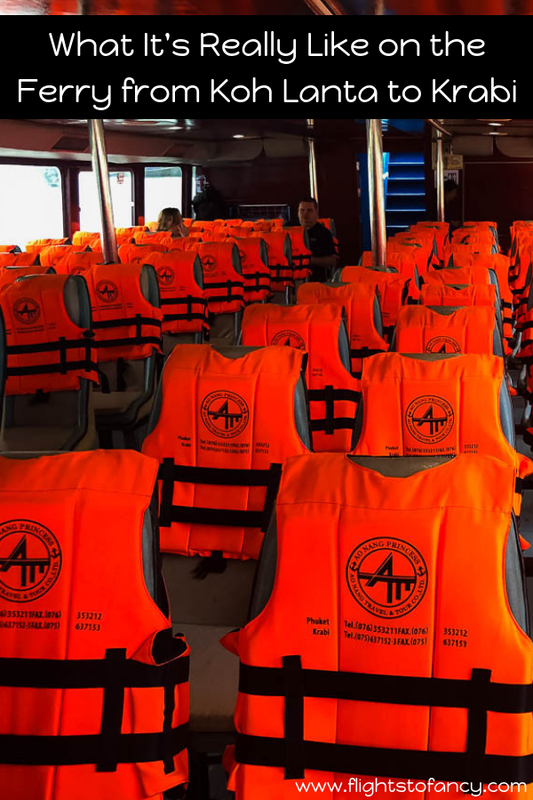 Having taken the ferry from Phuket to Koh Lanta a few days earlier, we had a good idea what to expect onboard the Ao Nang Princess. Or so we thought. This is public transport after all and a large part of the journey is dependent on the other passengers. 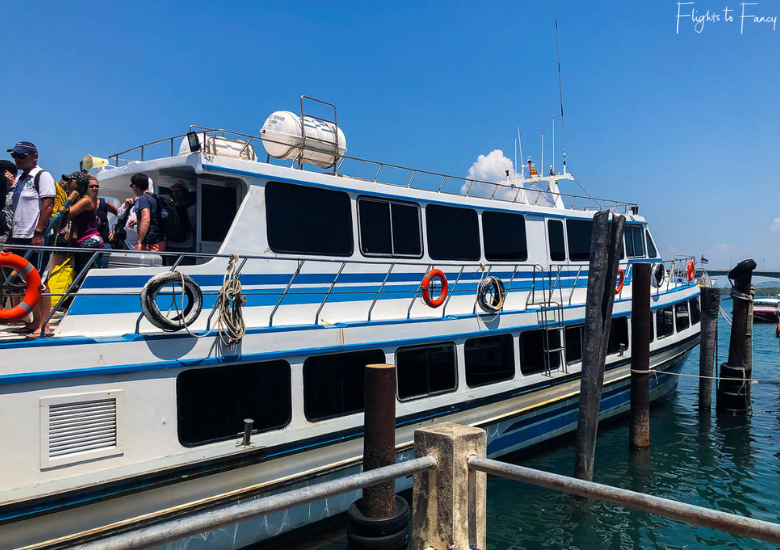 The boat was the same this time around, but our experience on the Koh Lanta to Krabi ferry was significantly different. We boarded at about 1pm knowing that we wouldn’t be leaving until 1.30pm. We figured it was as good a place as any to sit given seating on the pier was limited. The cabin on the upper deck was already fairly full so we headed to the lower deck which was virtually empty. In fact we sat in exactly the same seats as we had a few days earlier. It’s a bit like the flexi desks at work. In theory you can ‘sit anywhere’, but my colleagues and I always gravitate to the same place. In fact, I’ll admit I get a little snarky when someone sits in my spot. Things were going well until about 15 minutes before we were due to depart. All of a sudden the metal cabin echoed with voices shouting in 1000 different languages (probs about 5, but I’m prone to exaggeration and you get the drift). A European tour group had boarded and filled almost all the empty seats on the lower deck. We were surrounded. The guy behind me was literally screaming directly in my ear in Russian (I think?) as he leaned forward to yell excitedly at his mates across the aisle. I waited a moment to see if he would develop some self-awareness and realise the impact on those around him. When it was clear that wasn’t going to happen I whipped around sharply, glared at the offender and broke through the language barrier by motioning the globally understand hand signal for “SHUT THE F@%K UP” (shouting capitals absolutely intended!). He did, but paid me back for having the audacity to call him on his bad behaviour with 10 minutes of unnecessary seat back jostling. ***Sigh*** The others were not much better and none were capable of talking at a normal volume. One rather large guy sat in the seat next to The Hubs, despite empty seats being available among his friends. Why???? He then spend the entire trip leaning forward yelling (talking?) at them. His girth spilled out of his seat and into The Hubs’ personal space without apology. And he was dripping in sweat. And he smelt like beer and cigarette smoke. It was clear it was going to be a very long trip and I willed the boat to pull out from the pier so we could get going. 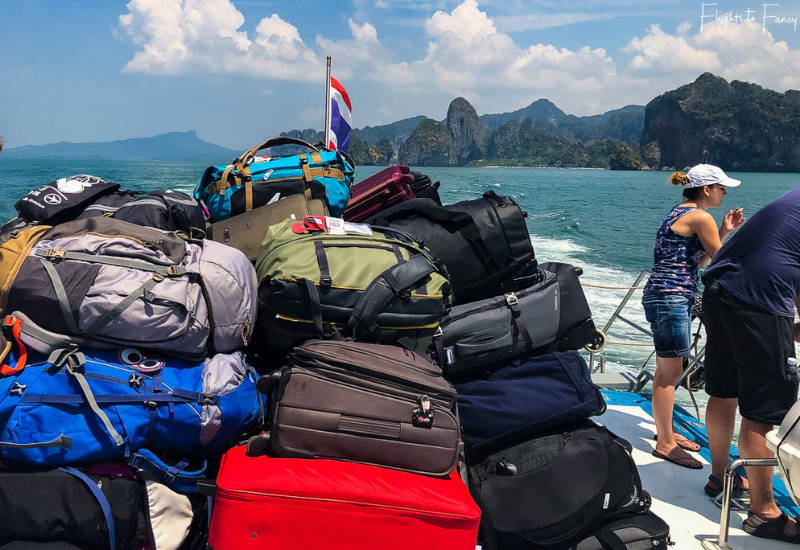 We pulled out at 1.36pm and thankfully the group seemed to run out of steam as the ferry chugged its way to Ao Nang and by 15 minutes in most of them were sleeping. Only a few remained ‘lively’ including the guy next to The Hubs. Because his standard position was leaning forward resting on the seat in front, getting in and out of our row was harder than it needed to be. The Hubs went to the small shop on board to buy a drink and his neigbour refused to stand forcing The Hubs to scramble over his substantial sweaty frame. I wasn’t going to subject myself to the same fate, so despite needing to go to the loo I stayed firmly in my seat. I found myself wishing I had used the pit toilet at the pier. One of my blogger friends, Roni The Travel Guru, always takes antibacterial wipes to wipe down airline seats. I’ve always kinda thought “yeah whatever, that’s a bit over the top, but you do you”. After seeing the slick of sweat this guy left behind, I completely understand why she advocates this. My phone didn’t charge properly the previous night and once again I found myself on a ferry in Thailand with plenty of coverage from my AIS tourist SIM card, but with not enough battery to browse for the entire trip. I tried to preserve my battery by taking a nap, but my body wasn’t having a bar of it. Once again, I found it difficult to get comfortable in the bucket seat where my feet didn’t touch the floor. I squirmed around like a contortionist for two hours and never really found my sweet spot. Given I was freezing on the first ferry, I threw the pashmina I purchased in Koh Lanta Old Town in the collapsible backpack we always travel with which was currently doing duty as our cabin baggage. I’m very glad I did as the air conditioning was set a little chilly for my liking. Our Koh Lanta to Krabi ferry docked at 3.30pm in Ao Nang exactly as planned. I almost whooped with delight. Almost. It was a relief to finally farewell our travel buddies. As we exited Ao Nang Pier we walked about 100 metres to the car park where the Ao Nang Travel & Tour buses were waiting. The staff allocated passengers to buses based on their accommodation location. We stayed at the Ananta Burin Resort in the heart of Ao Nang and we were directed to the last bus in the long line. When I say bus, I am being a little generous. It was a truck like open air tuk tuk that seated about 20. We were one of the first on board and I’m not ashamed to say I audibly sighed with relief when none of the rowdy crew were on our bus. 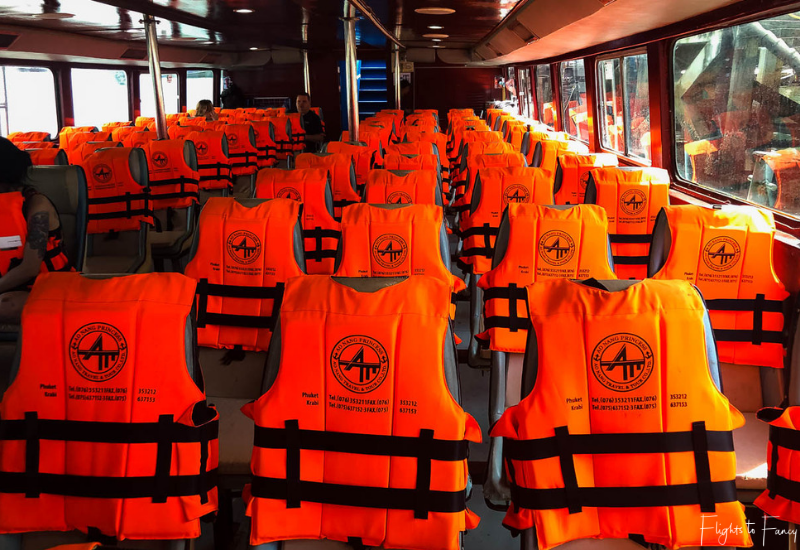 While our journey on the Ao Nang Princess was not particularly pleasant, this was in no way the fault of Klook or Ao Nang Travel & Tour Co. I would have no hesitation booking with Klook again. You can’t pick who you end up on public transport with and in this instance, we drew the short straw. Our time in Ao Nang was all to brief before we moved on to Koh Samui. Krabi was my least favourite of the three island’s we visited and I’m glad we allocated the shortest amount of time to this leg. Have you been to Krabi? How did you get there? I’d love to hear your experience in the comments below. Disclosure Statement: This post is not sponsored. I paid for my ferry from Koh Lanta to Krabi in full. The information in this article is based on my own personal experiences and has not been influenced in any way by the brand(s) featured. This post may contain affiliate links which if clicked may earn me a small commission on purchases at no extra cost to you. Well, travel brings good and bad experiences. Thank you about sharing information about Klook. Well, ferry ride experienced depend a lot on what kind of co-passengers who are sitting with. Not everyone is at the same page. Some people will be rude and non-adjusting. There will be others who be shouting or talking too loud. Thank God it had a toilet. Its best to keep wipes or Peesafe to clean the seats. I’m hoping to island hop in Thailand as well so I’m happy that you include your thoughts on each island. I’ve heard from others Krabi was not their favorite island either. I love how you detail your entire ferry ride to the islands. So sorry for the loud and rude man! Definitely going to use these resources on my trip. I took a similar ferry from Phuket to Koh Phi Phi last month and I booked through Klook as well. Great prices and it’s hassle-free. Haven’t been to Krabi just yet though but next time for sure when I’m back in Thailand! Thanks for the useful primer on traveling there. I will surely use Klook and check out what they have to offer on my next Thai trip!!! Krabi is, of course, the place to be in summer isn’t it? I have not been to Thailand yet, but we have been planning it for next year. Ferry rides there are definitely something we are most likely to experience since the coast and the islands seem so beautiful, and we would like to see it. Interesting to know that they really don’t have a luxury ferry but for Thailand I can actually imagine that. Sorry for the uncomfortable experience. Thanks for the tips about booking with Klook. I will certainly check that website out. Personal space – uummm what a trip, all I can say is I am so glad they all fell asleep. I think I will take antibacterial wipes next time, you just do not know when you need them. After reading your post I think we have very similar approach to getting the best deal. I’m not afraid to splash out on incredible experiences but as you said, I like to do things as cost-effectively as possible in order to do those things! I love the idea of island hopping, I like to see as many places on a trip as possible. Oh no I’m so sorry to hear about your ferry experience! Similar things have happened to me on my travels before, and I always hesitate to judge for fear that it’s a cultural difference and not just someone being a straight up a**hole. But yea, the utter lack of awareness that some travelers have (whether cultural or otherwise) boggles my mind. At least the journey wasn’t THAT long, and you were rewarded with a beautiful destination!